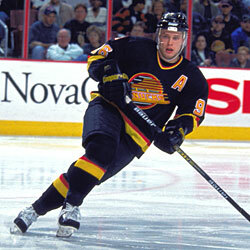 Bure began his NHL career with the Vancouver Canucks in 1991. Pavel Vladimirovich Bure was born March 31, 1971 in Moscow, the son of Tatiana Gvovana and Vladimir Bure. Pavel's father competed for the Soviet Union in swimming at the Olympic Games in 1968, 1972 and 1976, winning four medals. Pavel's grandfather also competed in the Olympics as a goalkeeper on the Soviet Union's water polo team. Pavel was a diligent student and by the age of 11, was named the best forward in his league. In July 1982, 12-year-old Pavel was chosen to appear in a television special with Wayne Gretzky and Vladislav Tretiak. Two years later, he joined the Central Red Army's junior squad. The Soviet national midget team, which included Bure, toured Canada in 1986. With the Canucks, Bure became just the eighth player in NHL history to record back-to-back 60-goal campaigns. His skills abundantly evident, Bure joined the Central Red Army team in 1987 at just 16 years of age. He was invited to the parent club's training camp for the 1987-88 season and although he was deemed too young to join full-time, Pavel was a spare, playing a handful of games when the team briefly lost several players to the Canada Cup tournament in September 1987. He joined the club full-time in 1988-89, setting a Soviet League rookie record by scoring 17 goals and was named the league's rookie of the year. That season, with a roster that included Bure, Sergei Fedorov, Slava Fetisov, Igor Larionov, Sergei Makarov and Alexander Mogilny, CSKA Moscow collected its thirteenth consecutive Soviet championship and twelfth consecutive IIHF European Cup. held in Salt Lake City, Utah. Following his draft, Soviet authorities denied the Canucks contact with Pavel. It wasn't until September 1991 that Pavel left Moscow for North America, joined by his father and brother Valeri. 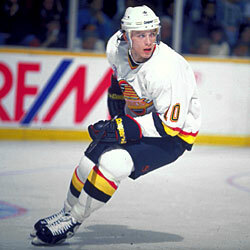 The Canucks began negotiating a contract with Bure, but before one could be finalized, the issue of his existing deal with the Central Red Army had to be settled. Vancouver's management met with officials from the Soviet Ice Hockey Federation in October of that year, negotiating a settlement. The Canucks offered $200,000, with Pavel astonishingly offering an additional $50,000. The Russian officials accepted the $250,000 settlement (the Canucks paid the full $250,000). Pavel subsequently signed a four-year contract worth a reported $2.7 million, making the rookie the second highest-paid player on the Canucks, behind captain Trevor Linden. In his first full season as a Florida Panther, Bure led the NHL in goal-scoring with 58 to capture his first of two consecutive Maurice Richard Trophy wins. During the 1994-95 NHL lock-out, Pavel returned to Europe to play hockey, but when the impasse was resolved, he returned to Vancouver and picked up 43 points in the 44-game season. During that spring, he set franchise records for most goals and most points in a single series with 7 and 12 respectively during a seven-game series win over the St. Louis Blues. The Canucks, however, were swept by Chicago in the second round of that season's playoffs. Following the 1997-98 season, Bure demanded a trade, despite having a year left on his contract. He did not report to the Canucks' training camp, instead, returning to Moscow where he practised with the Central Red Army team. During this time, Pavel was offered a $4 million US, tax-free salary to play in Belarus, but Bure declined the offer. 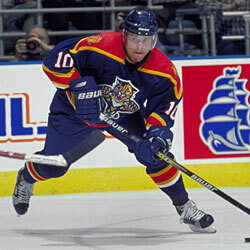 After holding out, Pavel was traded to the Florida Panthers on January 17, 1999. Moving to Miami with Bure were Brad Ference, Bret Hedican and a third-round draft pick in the 2000 NHL Entry Draft, while Mike Brown, Dave Gagner, Ed Jovanovski, Kevin Weekes and Florida's first-round selection in the 2000 draft. 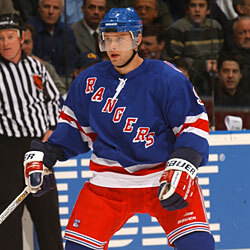 Bure finished his career with two injury-plagued seasons with the New York Rangers. Injuries plagued Pavel in Florida, too, and he played just 11 games in 1998-99, although he managed to score 13 goals and 3 assists. In 1999-2000, his first full season as a Panther, Bure led the NHL in goal-scoring with 58 to capture his first of two consecutive Maurice Richard Trophy wins. It marked the second time Pavel had led the league in scoring, but his first Rocket Richard Trophy, as the award had just been introduced the previous season. Combined with 36 assists, his 94 points was just two behind the league's scoring leader, Jaromir Jagr. Bure's production helped Florida to a fifth-place finish in the Eastern Conference, their first playoff berth in three seasons, although they were swept in the opening round of the post-season. Following that season, Bure was named as a nominee for the Hart Trophy as the most valuable player in the NHL, although the award went to Jagr. Pavel was named to the NHL's Second All-Star Team for the first time. Prior to the 2001-02 season, Florida acquired Valeri Bure from the Calgary Flames, uniting the brothers on the same team. But Pavel suffered a number of injuries through the season and appeared in just 56 games. Yet, he still led the team in scoring for the third straight season, collecting 49 points in a partial season. At the trading deadline, he was shipped to the New York Rangers with a second-round draft pick for Filip Noval, Igor Ulanov and New York's first and second round selections in the 2002 NHL Entry Draft and a fourth-round pick in 2003. Between the two teams, he finished the season with 34 goals and 69 points. Bure's injury woes continued, and he appear in just 39 games in 2002-03, managing 19 goals and 30 points. Due to the lingering effects of injuries, Pavel did not play at all in 2003-04, and with the lock-out of 2004-05, he missed two entire seasons. After the NHL resumed play in 2005-06, Pavel Bure announced his retirement at a media conference in Moscow on November 1, 2005. Bure's NHL career consisted of 702 regular season games in which he scored 437 goals and 342 assists for 779 points. His abbreviated career also included 70 points (an equal number of goals and assists) scored in 64 playoff contests.